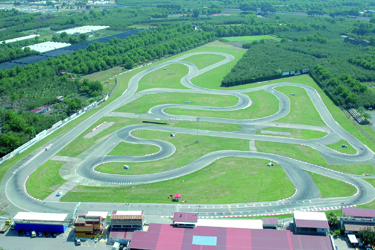 The Circuito Internazionale di Napoli in Sarno (Italy) – which will host the CIK World Cup for KZ1-KZ2 on 2nd September – has recently obtained the go-ahead by the CIK for the changes aimed at the gearbox classes. The innovations, which allow for a different configuration (in red) to enhance the gearbox races spectacle, involve the long straight after the first corner, which has been extended by 80mt., and the hairpins (in blue) that have been replaced by smoother turns. The KZ configuration will therefore be shorter of about 20mt., with the track measuring 1681mt. and laptimes consequently dropping. The new configuration is yet to be tested as works are still underway. The dates for World Cup tests will be announced shortly.